Ever-inspiring historical novelist, dear amiga, and author of The Art of Intuition, Sophy Burnham, has granted an interview to the Washington Independent Review of Books. Washington DC poet Sunil Freeman's splendid essay in Leslie Pietrzyk's also splendid Redux: "Reprieve for the Minor Pain Ladies"
Hilariously weird: Michael Savitz's "Confessions of a Used Book Salesman" in Slate. Benjamin L. Clark, The Exile Bibliophile, on "A Gentle Introduction to the Gentle Madness"-- of book collecting. You'll find The Exile Bibliophile on my blogroll under "Rare Books." "The Broken Book": A very consternating story about a magnificent book in Elaine Treharne's Text Technologies. 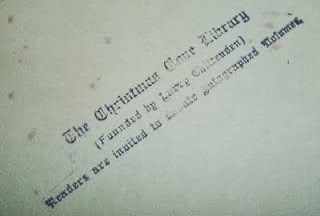 Speaking of rare book collecting, Susan Page Davis has a fascinating blog post about Texan rancher Larry Chittenden's Christmas Cove Library in (yes) Maine. Better than candy: For when you can't read (cooking, driving): Chris Gondek's delightfully crunchy podcast interviews for Harvard University Press authors over at Heron & Crane. My own most recent book, Metaphysical Odyssey Into the Mexican Revolution: Francisco I. Madero's Spiritist Manual Introduced and Translated, is now available in Kindle. The paperback edition, slightly delayed, will be available in January 2014, as will the Spanish translation by Agustín Cadena, Odisea metafísica hacia la Revolución Mexicana. And apropos of that, I'll be blogging next week about some of my latest rare book finds. More esoterica by the mysterious Dr. Krumm-Heller.